You are here: Home / BC Christian News / September 2009 / Is fanatical religion the root cause of wars? Is fanatical religion the root cause of wars? It keeps coming up: the contention that more people have been killed over religion than over any other matter. A friend of mine advanced it the other day. I’ve encountered it recently on an episode of CSI; on a rationalist webpage called the ; and in the book America by TV comedy host Jon Stewart. The Stewartian variant is the most specific: most wars, he writes, are started in the name of Jesus Christ, adding, “It’s a fact” — the only claim in his book so amplified. Stewart is echoing that eminent historian, George Carlin — who reportedly made this claim in all seriousness in a televised show from Carnegie Hall in 1977. Now it is repeated as axiomatic. But long before Carlin’s shtick, the propagandists of the Age of the Enlightenment started churning out the same message to discredit Christianity. According to Wikipedia, the Thirty Years War between German Catholics and Protestants is the deadliest religious war in history, and it comes no higher than 10th in deaths, with World War II leading, followed by some Chinese conflicts and Mongol conquests, World War I, the Russian Civil War, the Second Congo War and the Napoleonic Wars. But many of the early Christians, for example, were willing to die for their faith, but not to kill for it. True, institutional Christianity came to espouse other ideas: that wars could be justified if fought in national self-defence, or to support an ally, or to stop an unjust war, or to redress a wrong perpetrated by another country. 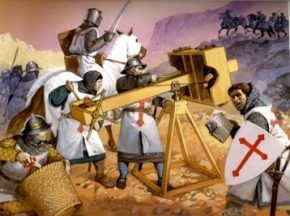 WWII and the notorious Crusades were fought for some of these reasons. The Crusades were largely initiated to defend the Byzantine Empire from Muslim attacks. Admittedly, in their execution, the Holy Land Crusades were sometimes immoral. Some later crusades in Europe were also waged partly to stamp out unwelcome beliefs, and also because monarchs used religious differences to increase their secular power. Most Christian denominations today, however, would condemn the use of force to spread belief. Doesn’t this prove religion does not inherently lead to intolerance and war? The early Christian martyrs arguably had a more extreme faith than the crusaders, because they were so confident Christianity would prevail they did not need to fight in its defence. So, religion or depth of conviction, per se, do not lead to intolerance and war. Most people are willing to fight for strongly held values such as the family, the nation, democracy and equality. The belief underpinning communism was equality. Should we then condemn equality as a value because communists were willing to starve multiplied millions for this noble goal? Should we condemn patriotism? The Nazis were, after all, motivated by patriotism. But so was Stauffenberg, the officer who attempted to assassinate Hitler. Nazi patriots believed Germans should rule the world. Stauffenberg believed Germany had a God-given duty to protect Europe. Both were willing to die and kill for their vision of Germany. Should we then outlaw patriotism along with religion? The Allies went into WWII believing freedom and democracy were worth fighting for. Perhaps we should outlaw those values, along with patriotism, egalitarianism and religion. Is it worse to fight for your beliefs than for the usual venal reasons for war — power, money, revenge or territory? The root cause of war is the human predilection for violence. We resort to it as individuals because we cannot control our anger, and because we assign very little value to other people. This will to violence is a lamentably common human characteristic, and one not especially related to religion or any intellectual position. In fact, many religions — such as Christianity — preach against violence. Of course, religions preach against other things too, like certain sexual behaviours. This is the real reason, I suspect, that people like Carlin and Stewart lash out at religions with baseless attacks, and why many others are so eager to agree. War is a very distant reality for most of us. But none of us wants to listen when our personal behaviour is challenged. So we shoot the messenger, with all available ammunition. Steve Weatherbe is a Victoria journalist.